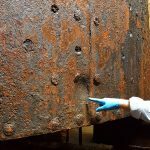 The USS Monitor had a short lifespan, yet was a truly revolutionary ship. After careful perusal, I can actually recommend the Wikipedia article on her as a good source for her history during the Civil War, and post recovery in 2002. I’ve read a lot about the Monitor during years of model building, general historical curiosity, and research for my New York Times pieces, so I was well versed in her past when I arrived at the museum on Friday morning. I was greeted by Hannah, who took me through the initial Monitor related exhibits. These artifacts include, among many other items, a busted Dahlgren cannon fired from the CSS Virginia, and a full-sized partial depiction of the Virginia herself. 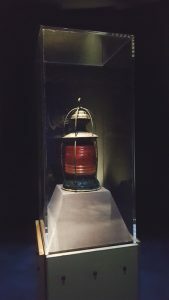 Several preserved artifacts recovered from the Monitor’s wreck are displayed, the most impressive of which is the red signal lantern at the top of this entry. 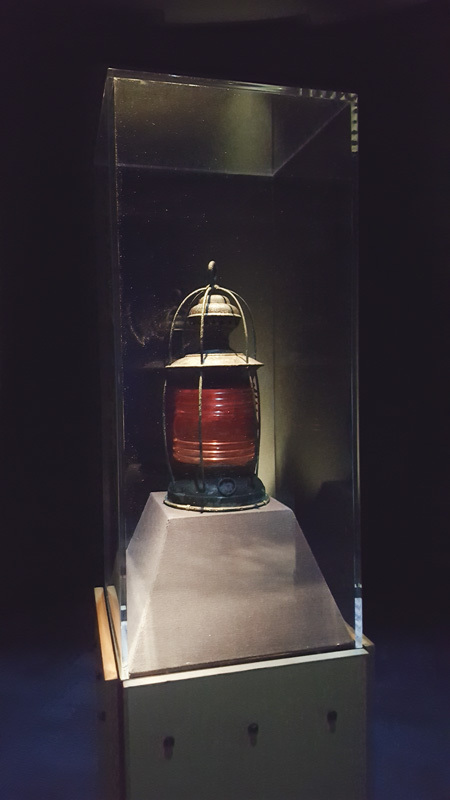 The red lantern, the distress signal the Monitor raised on New Years Eve in 1862, was the last thing anyone ever saw of her as she sank. 140 year later, it was also the first thing found of her wreck, spotted laying on the ocean floor, literally rolling in the sand and current, several hundred yards from Monitor herself. Before heading to the turret and restoration labs, we were joined by author and historian John Quarstein, a volunteer at the museum. John has written several books on the Monitor and other Civil War topics. Taken into the lab and given rubber boots, we proceeded into the tank. Kept perpetually damp, the rusted and blackened metal glistens and towers over you. The turret is only 9 feet tall, but it’s propped up on approximately 3 foot risers, to keep it out of the 6 – 8 inches of murky water that has an aroma of metal and mud. The walls of the tank that holds the turret are covered with the signatures of those who’ve worked on the project, the scribbled names all streaked and splotched by rust and grime. 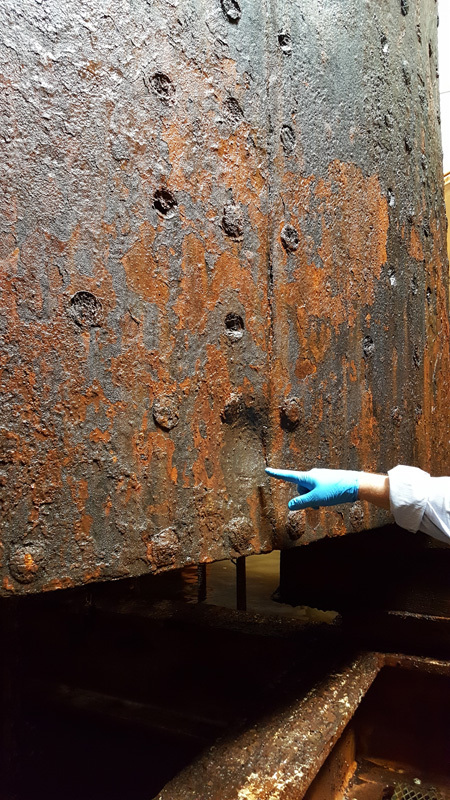 The turret itself is truly an impressive sight up close, and humbling to actually reach out and touch something so historically significant, (while wearing gloves, of course). Once the tour of the tank was done — unfortunately I was only able to see the outside, and really wish I could have seen the inside of the turret as well — we went through a lab where smaller artifacts are being restored, such as silverware, clothing, food bottles, and the gun carriage wheels. I did visit the rest of the Mariner’s Museum, and found it quite interesting, but while my love of history takes me to a lot of museums, I don’t take long to go through them. Leaving Newport News, I drove north west to Richmond. 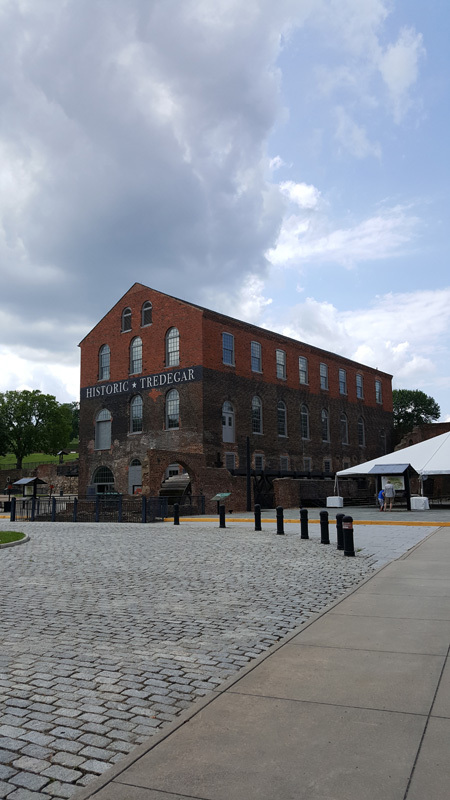 I’d never spent any time in the city before, and felt it a good stop-over for the evening on my way to D.C. Once checked into my hotel in the south part of town, I headed to the Tredegar Iron Works museum. Tredegar rolled most of the armor for the Confederate ironclads during the Civil War, and produced a significant amount of cannon and small arms. The museum is well done, if not a bit small. It was the first time I can remember being in a museum in the south that dealt specifically with the Confederacy, and I found myself pleasantly surprised to see, in their “Causes of the War” section, actual quotes from the the Mississippi Articles of Succession, that listed slavery as one of the main reasons for that state leaving the Union. It’s encouraging to see that the “Lost Cause” revisionism continues to lose its grip on the history of the war. 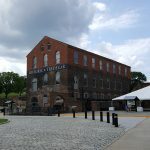 Tredegar was to be my only visit in Richmond; heavy thunderstorms moved in and instead of checking out the Confederate White House or the Edgar Allan Poe museum, I opted for a pub house across the street from my hotel and sampled some local beers with my dinner. 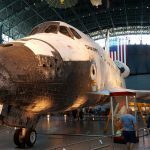 I hit the road early on Saturday and continued north, my destination the Smithsonian’s Steven Udvar-Hazy Center in Chantilly, Virginia. 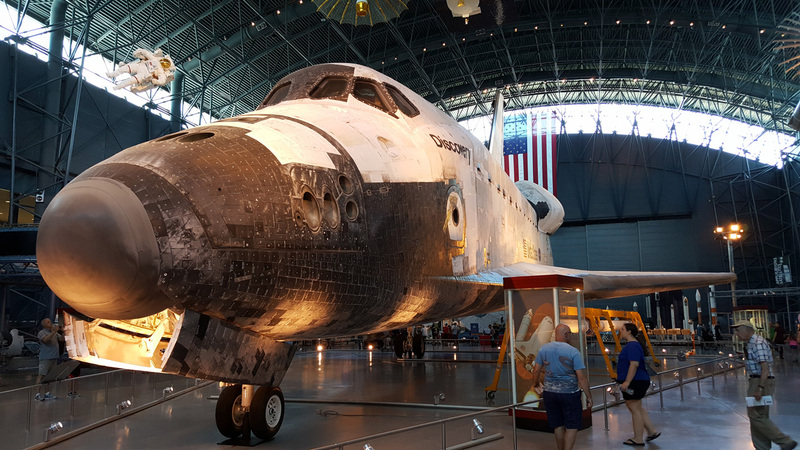 This is an amazing collection of civilian and military aircraft, as well as an impressive set of space hardware from NASA, including actual Mercury capsules and the Space Shuttle Discovery. There are a lot of aircraft there, my photos show maybe only a fraction of those represented. Everything from early biplanes, to the SR-71 spy plane, to a Concorde airliner, are represented, and each and every craft is historically significant in some way. Besides distant views of of the Pearl Harbor veteran Sikorsky JRS-1 seaplane, my favorite part of the museum was Discovery. She’s a well worn, carbon-streaked, bulky, utilitarian space craft that’s simply beautiful to behold. Even with all of the aircraft on display, I still went through the entire museum in less than 3 hours. 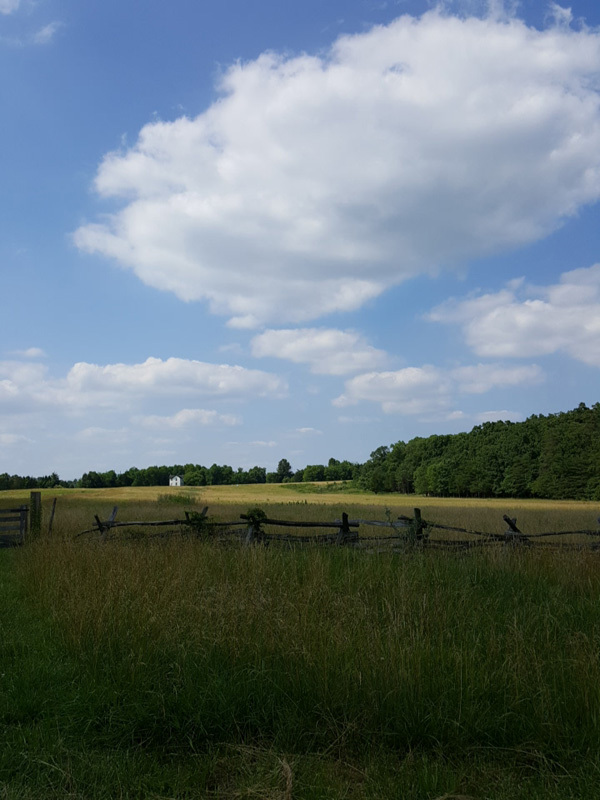 After which I drove a half-hour west to Brawner Farm, the site of The Iron Brigade’s first battle. It’s a small location, only a single house and an open field. Once finished there, I headed off to meet a fellow writer and friend for dinner. Sunday morning found me on the road early again, once more headed north. Intending to hit home around 3 in the afternoon, I wanted a couple of hours extra as my route took me through Gettysburg. 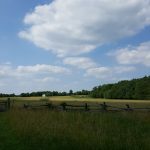 For a period beginning 9 years ago, I spent a good week every summer in Gettysburg, doing research, and generally history-nerding around. The past few years haven’t allowed me the time to do so, but I do try to get back at least once every year or so for a day’s visit. The place continues to change as they return more of the battlefield to it’s 1863 appearance. 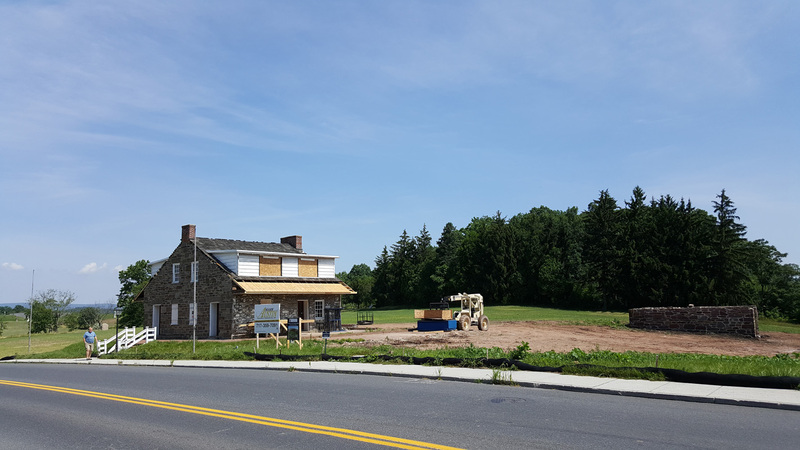 The most recent and dramatic change has been at General Lee’s Headquarters, an old house on the north-west corner of town, on the first day’s battlefield. 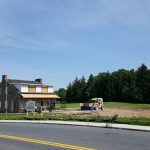 Once surrounded by a large single story hotel and restaurant, the property was purchased by the park several years ago, and has now been completely cleared. While I’ll miss being able to stay in that hotel and walk over to McPherson’s Ridge at sunset, it’s much better that the area has been returned to its original appearance. Now if someone would just buy that General Picket’s Buffet and McDonald’s in the middle of the main field and tear them down, too. A quick lunch in Gettysburg, and then off to home. Nearly 900 miles driving and it was all done. I love a good road trip. I’m beyond thrilled that I got to see the Monitor’s turret high and (mostly) dry. As I said, I’ve read and studied the Monitor and her sister ironclads, and built models of them, for years, but there’s nothing like standing right there and literally touching history with your own hands. The same with the aircraft at the Smithsonian. To see, in person, something that existed at critical points in time, and to get to interact with them, especially now that, in most cases, the people that used these machines are now gone, leaving said machines and fields of battle as the only tangible link to the past, brings the reality of history alive. It was a fantastic 4-day weekend, one that reminded me that I really have to make plans for a trip to the National Naval Aviation Museum in Pensacola, as well as Vicksburg, MS, to see the ironclad USS Cairo. History’s out there. All over the place. Go look at some.